This is a deck by Lisa Hunt, and published in 2005. I’m an animal lover, the more exotic, the better. This deck combines animals, both common and exotic, Gods and Goddess from dozens of cultures, and beautiful symbolism weaved into the artwork. 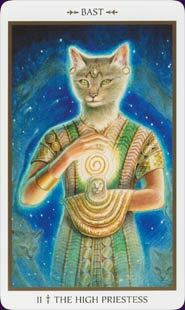 The deck is a traditional 78 card deck, with the Majors and Court Cards being represented by deities, and the pips being represented by animals within the respective element. I’ve found this deck is incredibly in-tune with me. As someone who loves animals, and who loves studying Gods and Goddesses from all sorts of cultures, this deck pretty much includes everything I want. The cards themselves are all beautifully illustrated. The colours on the pip cards are very reflective of the element they represent. My personal favourite cards are Death (represented by Sedna, an Inuit Goddess), King of Swords (Quetzalcoatl, Aztec), King of Pentacles (Ahau Kin, Mayan),Ten of Cups (whales), and Five of Swords (bats). Each of these cards speak to me on a very spiritual level. 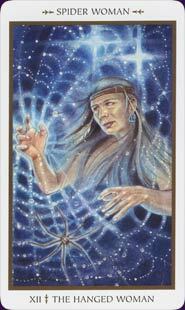 Some of the cards I dislike are The Chariot (Freya, Norse), The World (Gaia, Greek), Knight of Pentacles (Mistress of Animals, Minoan), Three of Cups (polar bears), Two of Wands (dragonfly), and Ten of Pentacles (rabbit). These cards, though visually pleasing, don’t seem to have the same sort of meaning as the rest of the cards in the deck. These are more stylized, as opposed to some of the more realism throughout the deck. I’ve used this deck quite a lot since I got it. I’ve had it for at least six months, if not more. 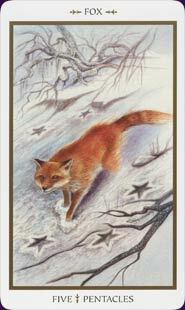 For anyone who feels a connection to multiple animals, or even multiple cultures, this deck will be a joyful addition to their collection. Or, perhaps, even start a collection.